Buiding Your Own Home Theater? If you’re in the market to put a home theater in your house, you’re in luck – there are so many options that you’ll be able to find several alternatives to fit any budget. There’s more to it than just a giant screen and great speakers, so here are some things to consider when building out that movie viewing space. Light and colors affect how you see the screen – everything from the paint on the walls to the sun shining outside the window can negatively impact the view. If possible, set up your theater in a windowless room. Not possible? Opt for blackout shades that sit tightly against the window frame, and use heavy drapes over top. This is a nice option if your theater room is also a playroom or living space, so you can let the sunshine in the room during non-movie times. Select paint colors for the walls and ceiling that are dark and neutral. Think beige, brown, and shades of olive. Stick with flat or matte paint sheen, as any type of gloss can reflect light back onto your screen. Choose deeper colors for the carpet flooring as well, and use a good, thick padding underneath. This will help dampen sound and provide a cozy spot for kids who like to sit on the floor. A good sound system is essential to the movie theater experience. Most DVD and Blu-Ray discs project 5.1 surround sound, but some do 7.1 as well. This means that you’ll want to get a center channel speaker and place it just underneath the screen, two side speakers next to the screen, the subwoofer on the floor in a front corner of the room, and two speakers on either side of the back of the room. For a 7.1 system, there will be two extra speakers placed in the middle of both side walls. Consider mounting the rear speakers from the ceiling for an even more immersive sound experience. 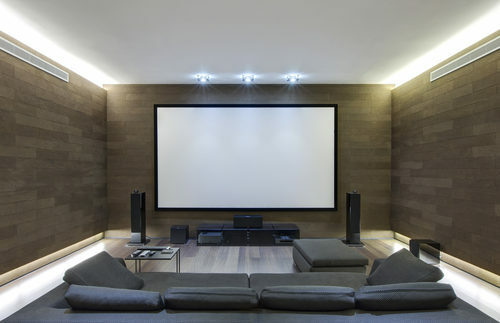 Also, setting up a home theater in a rectangular shaped room is ideal, using the short walls for screen and speaker mounting. The screen is second only to the sound. You can opt for a TV or use a screen and projector. Take a look at the different features and options at your local electronics store. You may be surprised at how the costs have come down for HDTVs if you haven’t purchased one recently, and you also may be surprised at the quality of a projector. Be careful not to choose a screen that’s too big for your room – you don’t want to have to turn your head to see all the action. Measure the distance from your couch or chair to the screen in inches and divide by two. The resulting number is the maximum screen size you should consider. Now, go grab that bowl of popcorn and curl up with a blanket and enjoy the show!